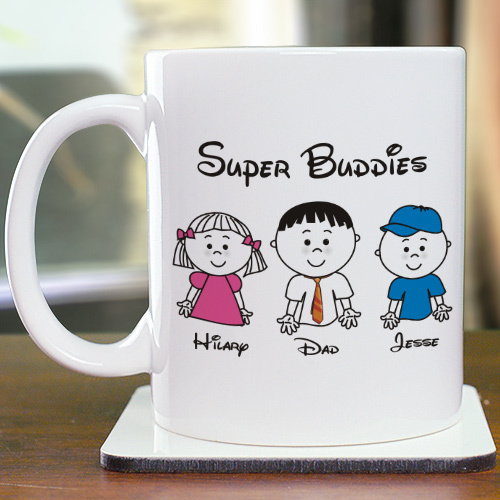 Your kids are the best buddies you could ever have, so display it with our Personalized Super Buddies Coffee Mug. Display all your wonderful kids plus yourself with these fun buddy custom Dad Mugs, mugs for mom, gifts for Grandparents and more. A great Personalized Father's Day Gift Dad or Grandpa will love. Your Custom Printed Father's Day Mug is Dishwasher safe and holds 11 oz. Includes FREE Personalization! Personalize your Super Buddies Coffee Mug with any 1 line custom message(ex. Super Buddies), Grandpa or Dad and up to 12 names. Please specify girl or boy, i.e. Jordan(b). Awesome, totally love it! Can't wait to give it out at Christmas. This is a great mug to give as a personal Valentine's Day gift, Sweetest Day gift, Birthday gift, Mother's Day gift, Father's Day gift or any special occasion. Our Personalized Coffee mugs can be personalized with any title making it an extra special Personalized Gift. GiftsForYouNow.com has many additional Personalized Coffee Mugs for your special gift giving needs. We also specialize in beautifully personalized photo frames, personalized photo mouse pads plus much more.